Perhaps you’ve seen the movie with Johnny Depp and Juliet Binoche. It’s a wonderful film, perfect as it is. If you haven’t read the book – get it as fast as you can. It’s very different from the movie, but no less wonderful. The book-movie relationship is similar to that of “Practical Magic” by Alice Hoffman or “Witches of Eastwick” by John Updike. The books have only a nodding acquaintance with the film scripts. The character names and settings are the same. Some of the plot devices are borrowed for the film. But overall, the internal drama of the books is lost in translation to film. Cinematic story-telling demands a different viewpoint, and internal, mental character dialogs carried on in a memoir-like fashion don’t translate well to film. And if you must know the truth, a great deal of the real witchcraft of all three books, “Practical Magic,” “Witches of Eastwick,” and “Chocolat,” is edited out of the film script. If you’re a witch, you don’t want to miss reading any of these novels. Harris’s novel is lighter than the other two, and in some ways more accessible to readers. The story begins when the main character, Vienne Rocher and her 5-year old daughter Anouk visit the Mardi Gras carnival at the small French town of Lansquenet-sous-Tannes. They have moved many times, and Anouk wants to stay. Vienne rents an old bakery building and opens a shop, “La Céleste Praline: Chocolaterie Artisanale”. The story is told as dated diary entries. The entries switch from Vienne and her struggles with adapting to the restrictive attitude of a small town, and entries by Monsieur le Curé Reynaud, the Catholic priest. Vienne gets acquainted with the villagers very quickly and makes friends with as many as she can, including the ostracized members of the small community. Curé Reynaud becomes Vienne’s implacable opponent. It is Lent, and she tempts them with chocolates. He preaches against her and tries to keep his flock away from her pernicious influence. Suppressed rebellious elements of the community rise to the surface. Different things set them off, including the arrival of boat migrants at the docks of the River Tannes. Vienne and her new friend Armande Voison attempt to aid the migrant water people. Curé Reynaud struggles with memories of an earlier violent episode with boat people. The battle lines are drawn. The more Curé Reynaud pushes her, the more Vienne fights back with friendliness and spells. She does readings with her mother’s tarot cards. Indeed, a single tarot card plays a crucial role in the climax of the story. Vienne admits her mother was a witch. She puts her own magical energy into making fabulous sweets, but Vienne is capable to making a charm or two to aid her cause. Her card readings push home things she needs to watch for in her environment. The film is delightful, but the book is a celebration of witchy secrets, food laden with spell-drenched passions, and mystical thoughts. The novel is an interesting assessment of the way modern witches are treated by fervent Christians. In this case, the attempt to drive Vienne from the community backfires, in part because there were so many problems hiding beneath the town’s calm surface that only needed a bit of prodding to blow. Vienne triumphs in part because of her humanity, tolerance, and charm, as well as her need to send down roots and create a lasting home for her daughter Anouk. 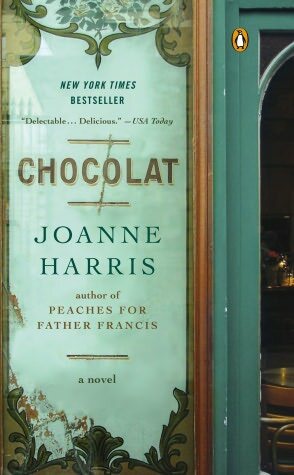 Readers who enjoy “Chocolat” will also be interested in a later book by Harris, “Holy Fools” (2003). This book also centers on a single mother with a young daughter, but the story is set in the 16th century. Much like Vienne, the heroine of this book, Juliette, is magical without being overtly witchy. In both books, Harris focuses on outsiders with a magical world-view struggling to make a home and find acceptance in small, homogenous communities.